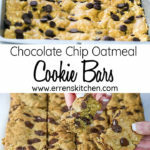 Chocolate Chip Spiced Oatmeal Cookie Bars - Scrumptious in a pan! These tasty treats will keep you coming back for more! This is a great recipe to get the kids in the kitchen - they'll enjoy helping and love the results too! 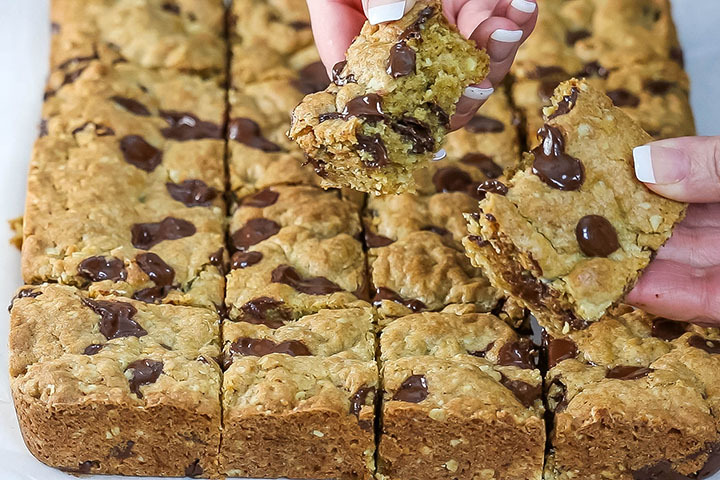 This easy recipe for Chocolate Chip Oatmeal Cookie Bars is a one bowl buttery treat perfect for holidays and bake sales. 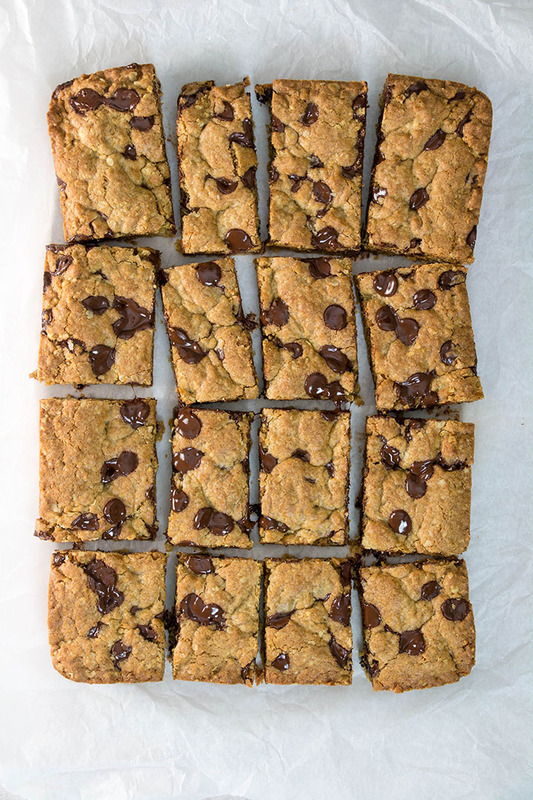 These Cookie Bars are literally the most simple thing you will ever bake. You don’t need to be a master baker to perfect this recipe. You will be thrilled with the results. My twist on these chocolatey delights is to use cinnamon and nutmeg as well as vanilla, resulting in a mouth watering spiced surprise. The melted butter keeps things simple and hassle free. 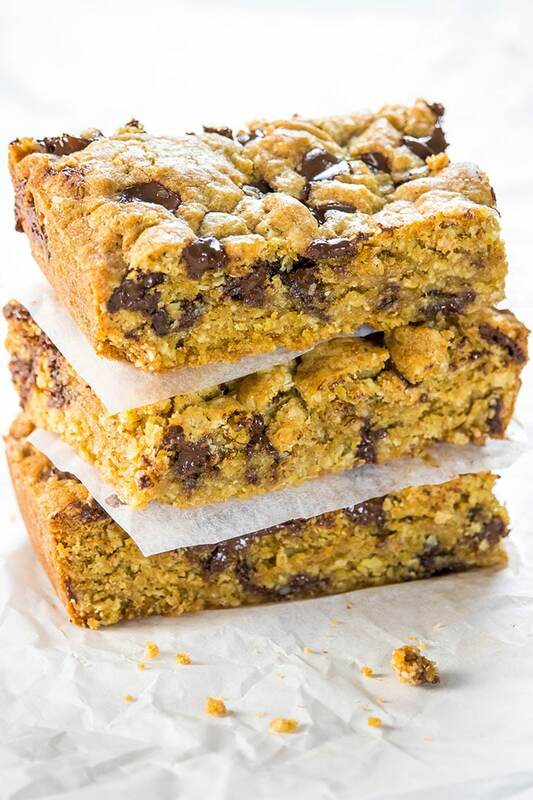 What Is a Cookie Bar? 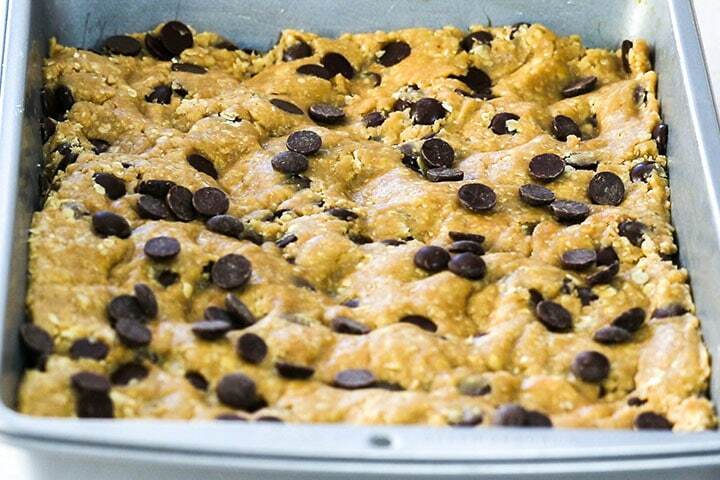 A Cookie Bar is cookie dough that’s spread and baked in a pan, as opposed to making individual cookies. Once baked it’s cut into bars. Easy! 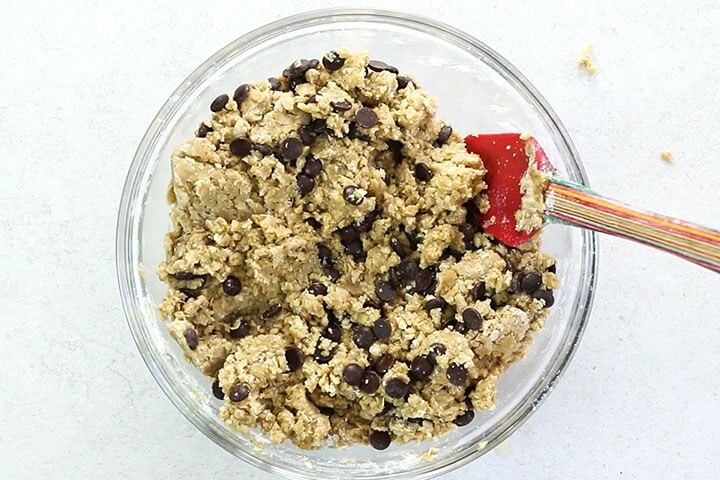 To make these Oatmeal Cookie Bars you just put all the ingredients in the bowl and mix, spread into a pan, and bake. It’s that simple! The best oats to use are old fashioned rolled oats. Instant oats will not work with this recipe. Old fashioned rolled oats are best for baking as they hold their shape and give you the chewy consistency you’re looking for. The best chocolate chips to use are the ones you love best. There are no rules! Preheat the oven to 375 degrees F/190C. Grease and flour an 9 x 12 baking pan. 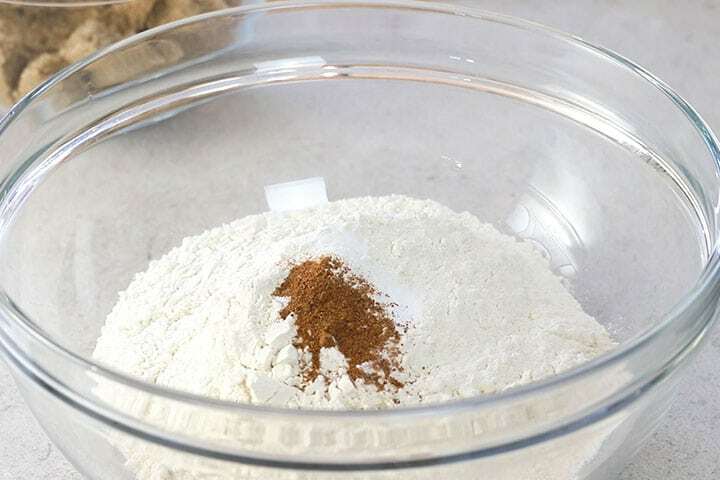 Sift the flour, salt, baking soda, baking powder, cinnamon, and nutmeg together into a large mixing bowl. Add the butter, brown sugar, granulated sugar. Add the eggs, vanilla, and rolled oats. Mix until combined. Add the chocolate chips. 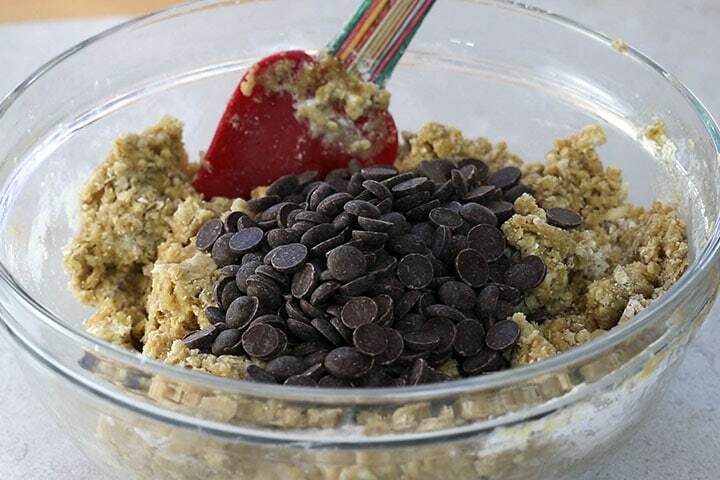 Sprinkle with extra chocolate chips. Bake until golden. Allow to cool for ten minutes before removing from the pan. After baking for 30 minutes, give the pan a little shake. If it jiggles in the middle, put the pan back in the oven and try again every 5 minutes until there is no longer any jiggle. For a more even look, use an offset spatula to spread the dough evenly into the pan. 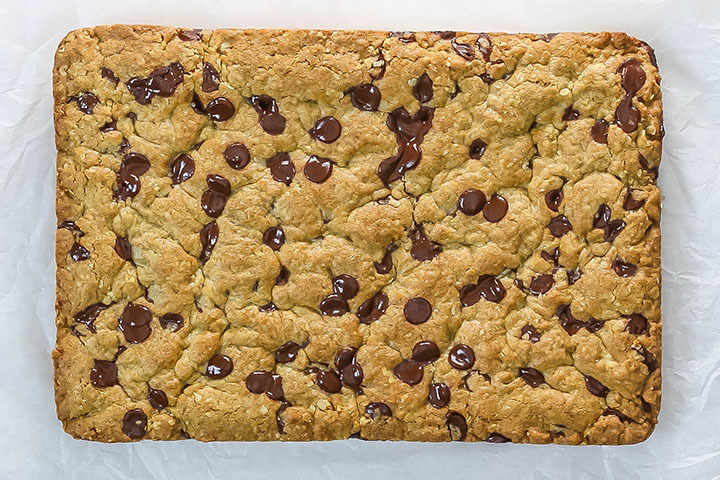 For a more professional looking slice cool the cookie bars completely before slicing. You can also chill in the refrigerator to fully set before slicing. Chilled bars cut cleaner. Use a ruler for your first slice to make the straightest possible cut. I recommend using a wooden spoon instead of a mixer in this recipe to avoid over mixing, which will result in a tougher bar. 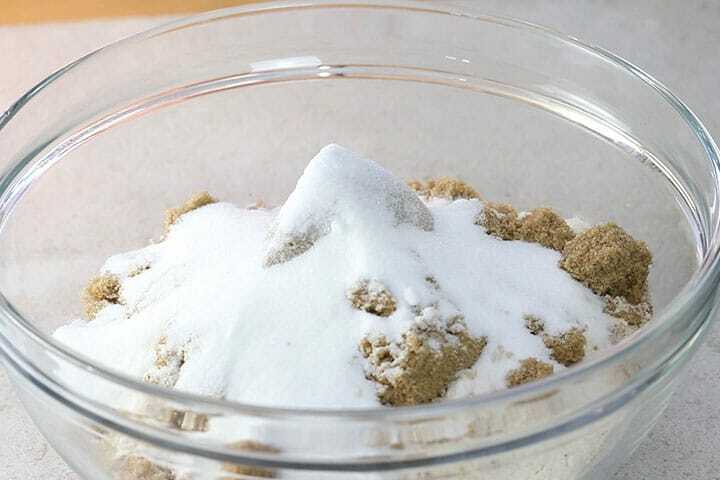 Sift the flour, salt, baking soda, baking powder, cinnamon, and nutmeg together into a large mixing bowl. 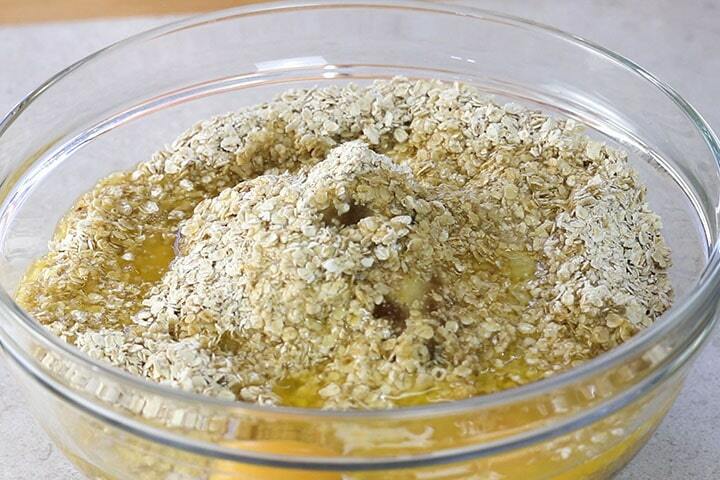 Add the butter, brown sugar, granulated sugar, eggs, vanilla, and rolled oats. Mix until combined. 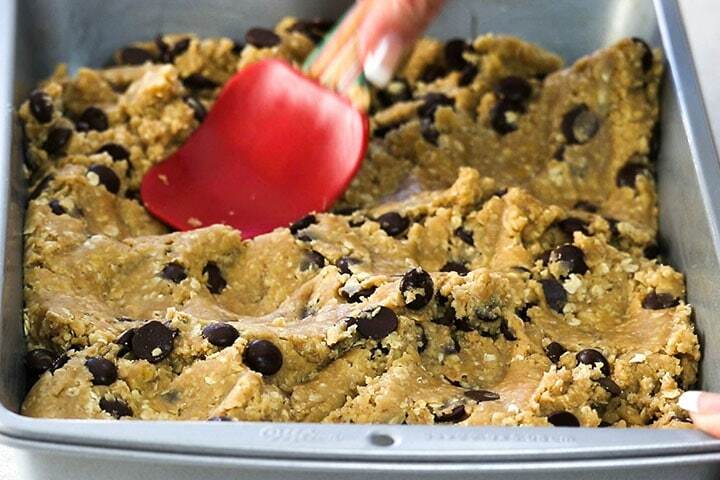 Fold in 1 cup of chocolate chips and spread evenly into the pan. Sprinkle with remaining chocolate chips. Bake 30 minutes. After 30 minutes, give the pan a little shake. If it jiggles in the middle, put the pan back in and try again every 5 minutes until there is no longer any jiggle. Remove from the oven and let cool 10 minutes before cutting. Best served warm, but great cooled as well. Update Notes: This post was originally published on Aug 29, 2016, but was republished with new photos, step by step instructions, tips, and FAQs in March of 2019. 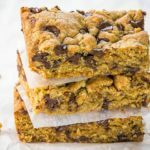 I felt that the oats needed the liquid of the melted sugar to bring this together to make a chewy bar— and do kept the amounts. We doubled this and baked on a half- sheet pan, turned out great! We used 4 cups of chips- I each of bittersweet, semi sweet, milk and white chocolate. I also used some dried orange zest, which I usually do whenever I bake with cinnamon and nutmeg. (3 tsp.) This turned out fantastic! There is a slight saltiness that offsets the sweetness nicely. Took these to share with the cast of my daughter’s spring musical and they were a huge hit! So glad you made it work for you! Thanks for the great feedback! Could you substitute applesauce for sugar in this receipe? I honestly have never tried it! However, if you do touch base and let me know how it goes! Ridiculous amount of sugar though. … I reduced both quantaties be about 100g total, think you could probably half the total sugar content and it would taste good. I agree, sometimes baked goods that include oatmeal tend to be a little dry. I’m adding this to my list of goodies to make! They look like they have the perfect texture and who can resist all that chocolate! 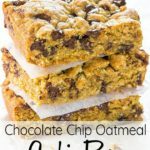 Love this for snack or dessert! I might have to go crazy and have it for breakfast!